As Continental Congress approaches, NSDAR is pleased to announce the 20th Anniversary of Heritage Club! This milestone celebrates 20 years of recognizing NSDAR’s generous donors. We have achieved so much because of the dedication of Heritage Club members, and we can’t wait to honor these donors with the wonderful celebrations at this year’s Continental Congress. The Heritage Club was created 20 years ago to recognize donors who had made cumulative contributions of $500 or more to NSDAR. As always, all gifts (excluding planned gifts) made to the National Society for any purpose count toward recognition in Heritage Club. This encompasses all of our DAR funds that promote historic preservation, support education, and instill patriotism and American heritage. NSDAR originally created six giving levels within Heritage Club to acknowledge the generosity of our Daughters. Due to the continued success of the program over the years, as well as the growing generosity of Daughters, two new levels were added in 2013 to make membership more attainable for all donors. The Heritage Club was founded during the Love Administration. Honorary President General Merry Ann T. Wright was the Director of Development at that time, and 745 charter members had already qualified for recognition. Since then, the Heritage Club has flourished, with more than 15,000 active supporters today! One of the reasons that Heritage Club has been so successful is due to the Sustaining Supporter Monthly Giving Program. In 2014, all Sustaining Supporter donations were added to the list of qualifying donations that counted toward recognition in Heritage Club. For instance, if a Daughter signs up for a monthly gift of $17.76, she will attain the first level of Heritage Club in less than 2.5 years! Every Continental Congress, it is a privilege to celebrate the dedication and devotion of our Heritage Club donors. 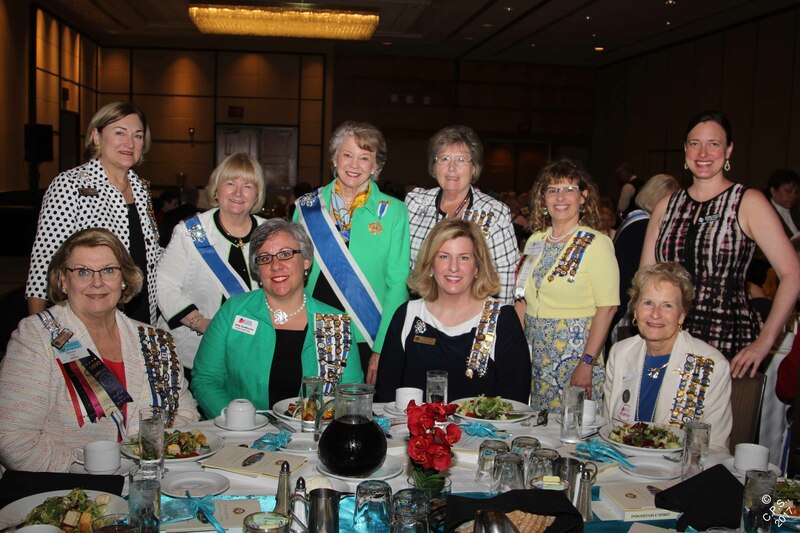 NSDAR honors their generosity with three individual recognition events: the Heritage Club Breakfast Briefing, Power of Women Lunch, and Afternoon Tea. Last year, more than 370 honored Heritage Club members joined the events at Continental Congress. Because this year is the 20th anniversary of Heritage Club, we hope that all Heritage Club members will participate in the event that corresponds to their Heritage Club Level! If you are a Heritage Club member and want to be a part of our Continental Congress events, please look for an email invitation in late April. If you have not yet been recognized in Heritage Club and are attending Congress, or if you have not received your email invitation by late April, please call the Development Office at (800) 449–1776. They can help you determine your total giving level and make appropriate donations as needed, or help you sign up for the Heritage Club events. It is not too late to become a member of this remarkable giving society. NSDAR doesn’t want you to miss the celebration! The Heritage Club donor recognition program has been a terrific addition to the NSDAR’s Office of Development to encourage generous Daughters to share their resources, to serve as role models to other Daughters, and to be recognized for their ongoing commitment. When you become a member of the Heritage Club, you can rest assured that your support helps bring our mission to life. The Heritage Club is an important way to recognize the donors who make it possible for NSDAR to continue its mission to promote historic preservation, education and patriotism. On behalf of the National Society, thank you for your ongoing support. NSDAR’s youngest Heritage Club member is 22, and the eldest is 109! The Heritage Club symbol is based on the window located above the main entrance of Memorial Continental Hall. Our founders selected this beautiful architectural detail, which has welcomed members to Headquarters since it opened in 1910. The enlarged picture of the Heritage Club lapel pin that each member received at Continental Congress Heritage Club events in 2017. This picture represents the iconic flag mural, which adorns the lunette above the stage in Constitution Hall and includes various Revolutionary battle flags. The masthead of our very first Heritage Club newsletter!